Sunday afternoon saw the first Metro League Division 3 run out of the season for our J1s in Terenure.A surprisingly warm, sunny climate greeted the players as they ran out onto the new 4G playing field. With last years U20 coach Kevin Finlay taking over from Adrian Hanley as the new head coach, the players were keen to impress from the offset. Our forwards dominated the scrum from early on, driving Terenure back in every scrum with prop Big Dan Cronin leading the charge. The first score of the day arrived after 15 mins, following yet another impressive scrum as our captain and no 8 for the Day Tiernan Mealiffe barged over for the first try. Unfortunately the conversion attempt hit the post. Terenure responded instantly and scored from a quick KO, however they too missed their opening conversion. Tullamore responded again with the pack dominating and the powerhouse of Tiernan Mealiffe driving over for his second try. Outhalf for the day, Conor Hegarty successfully slotted over the conversion to leave the score 12-5 in favour ofTullamore. Terenure hit back with some clever backs play and testing us with high kicks and the bounce on the 4g surface working to their advantage. They scored 2 tries and converted 1 to leave it 12-17 at halftime. Head coach Kevin Finlay gathered his warriors and got them prepared for a big second half. 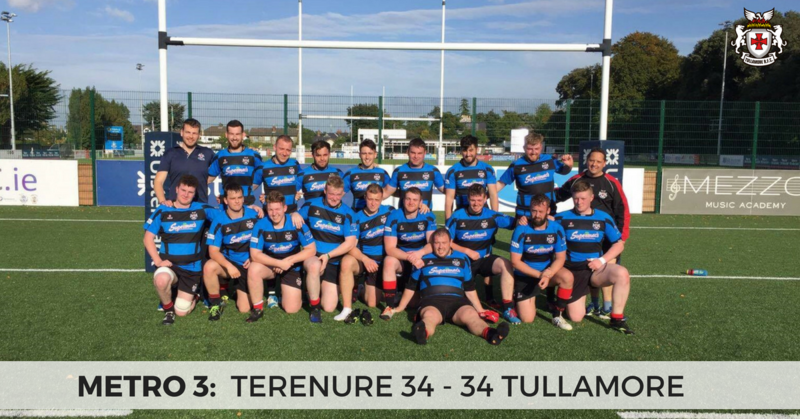 From the restart, Tullamore hit Terenure hard and the back line well and truly kicked into gear with big carries from Jerome Scully and Sean McCabe. McCabe showing his pace big time by running in a try from the half way line to leave the sides level at 17-17. Young Eoin Farrell caused Terenure a lot of trouble when running with ball in hand, while another strong scrum from Tullamore left Mealiffe with the perfect platform at the back of a scrum. Mealiffe picked and popped off to the newly converted scrum half sensation Odhran McIntyre who slotted over forTullamore's 4th Try. Heggarty added to the day's tally with 2 more points from the conversion to see Tullamore 24-17 in front. The hosts didn't back down however and soon after scored another converted try after some some defensive errors. A penalty kick added even more points between the two teams leaving the score 27-34 to Terenure with only 5 minutes left on the clock. Dan Cronin was struggling with knocks but continued on and proved he deserves his place in the squad with a superb performance. 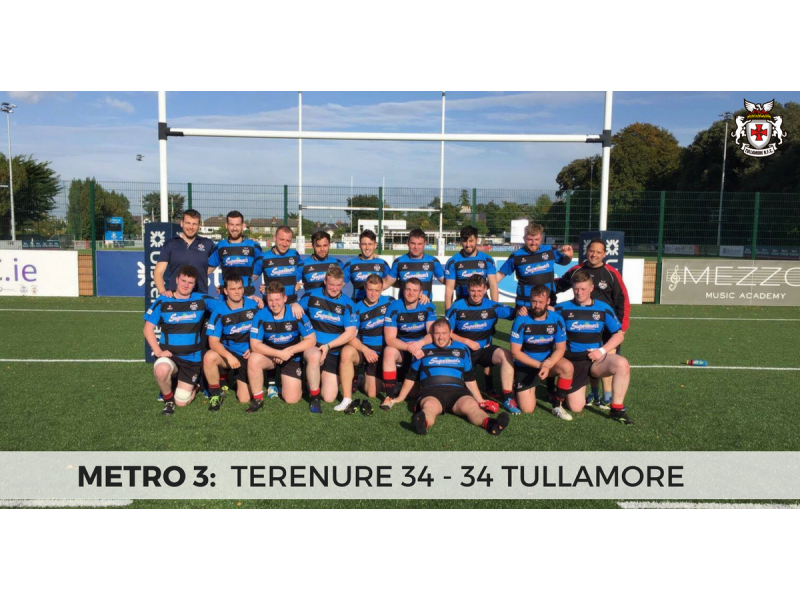 Tullamore dug deep and attacked Terenure with everything. Eoin Farrell came close with a big break, however Cronin was held up over the Line and Brian Ryan just missed out in the corner. Tullamore won a scrum on the 5 metre line with 1 minute left on the clock. Once again another powerful scrum left Odhran McIntyre with his second try of the day and to leave 2 points in it with a conversion needed to tie things up and take home 3 well deserved points. A huge sigh of relief when the conversion successfully sailed over the posts! All in all a positive day out with plenty to work on Tuesday and Thursday night.